The Rialto Bridge was the first permanent bridge constructed to pass over the Grand Canal in Venice, Italy. The name comes from "RIvo Alto", meaning the "high channel" but has gradually become condensed to Rialto (Freeman). The bridge connects San Marco to San Polo. When migrants first reached this area, they saw it as an ideal area to cross the water, that became the Grand Canal, because the gap to the other side was narrower and there was firm enough ground to hold a structure (Freeman). But before the bridge was professionally constructed of wood in 1275, a line of boats stayed in the area to allow people and goods to cross the water to the food market. Next, a wooden bridge rose above the canal, but it collapsed a total of three times before the city decided to design the bridge in an alternative way in 1524 (2014). Antonio da Ponte was the architect of the marble bridge that stands today. This job was incredibly important because the Rialto Bridge was the only way to cross the Grand Canal on foot for 263 years, until the construction of the Accademia Bridge (Imboden). He was chosen to supervise the project when he won a competition based off his design. Michelangelo also entered a design, but passed away before the city proceeded with construction (Freeman). The building of the bridge was postponed due to plagues that swept across Italy (Freeman). Da Ponte's design was declared as the planned layout in 1588 and included a single arch to hold up the bridge (Freeman). A single arch bridge is more difficult to build, but it is easier for boats to pass under. Antonio da Ponte began work in 1588, but faced difficulties due to the depth of the water and instabilities ("The Rialto Bridge "). The Rialto Bridge took three years to construct, 1588-1591, and was created by Antonio da Ponte. Before construction of the bridge itself could begin, hundred of logs were hammered into the ground to create a stable surface to hold the bridge. 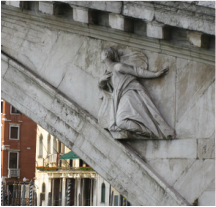 The Rialto Bridge is made out of "Pietra d'Istra" (Tolley). This is a white limestone that will not wear down from weather or erosion and does well resisting salt water, all of which are essential due to the location of the bridge (Pietra d'Istria). The surface of the rock is smooth and reflects light to naturally make the bridge a focal point on the Grand Canal (Tolley). Carved into the stone are images that symbolize the history of Venice. On the North side is an image of Saint Theodore, which happens to face toward Saint Mark (Freeman). On the other side is the Angel Gabriel and the annunciation (Freeman). 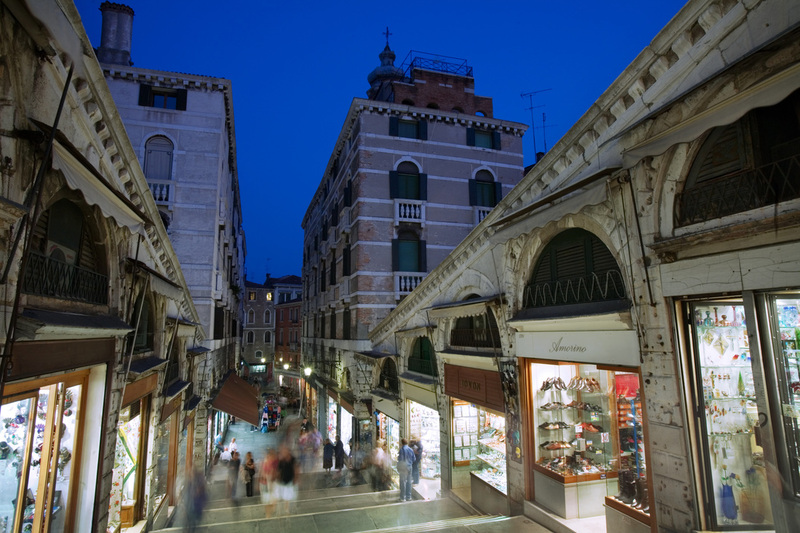 The Rialto bridge has three ways to get from one side to the other: a broad middle walk-way that is lined by stores on each side and two stairways on the backside of the stores that is visible from the Grand Canal. The stores were created on the bridge to help pay for the upkeep. They also go well in the area that has always been a market. Rialto Bridge Dimensions. by Maria Owens. Used under CC BY. The Rialto Bridge is a popular destination to paint. The first painting below, Miracle of the Cross at the Ponte di Rialto, shows the wooden bridge that was used before the marble Rialto Bridge. You can see that the top of the bridge has a drawbridge to allow taller vessels to travel under the bridge. 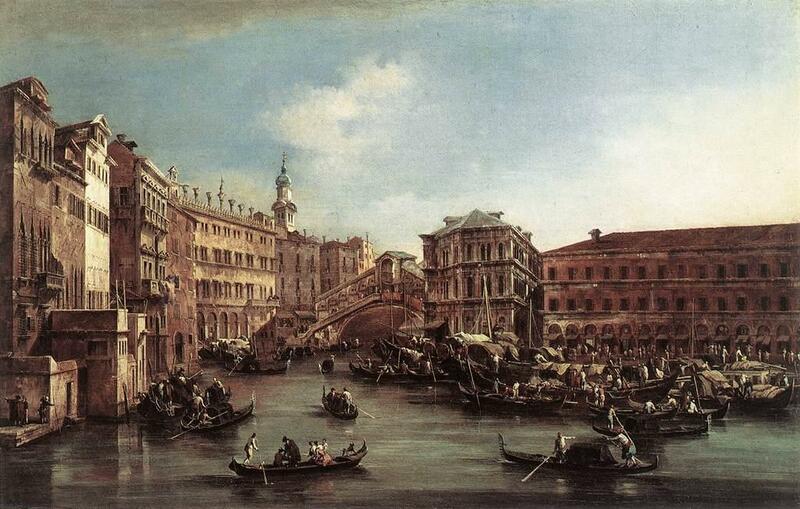 The second painting was done in 1740, and shows the busy area of the Rialto Bridge. The painting is called Grand Canal With Rialto Bridge and is done in oil paint on canvas by Francesco Guardi (Grand Canal). Along the Grand Canal many locals try to sell paintings of the Rialto Bridge that they personally have created or other "no name" artists have done. 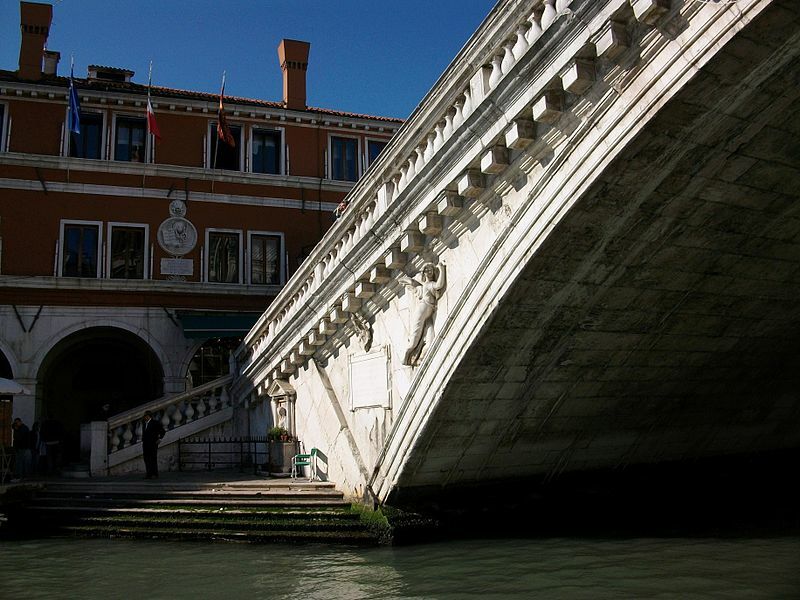 Besides in paintings, the Rialto Bridge is a setting in Shakespeare's "Merchant of Venice". Shakespeare uses the bridge as a meeting place and an area to catch up on the latest local news, which is what many Venetians use the bridge as today. Carpaccio, V. (c. 1496). Tempera on canvas. Retrieved from http://en.wikipedia.org/wiki/Miracle_of_the_Relic _of_the_Cross_at_the_Ponte_di_Rialto. Available at Gallerie dell'Accademia, Venice. Freeman, C. (2006, September 1). The Bridge of Venice: Charles Freeman Visits a City That Has Been Defined by Its Waterways-And above All, by Its Bridge. History Today, 9-11.